It will be interesting to see. Some of us overrate Altherr and some of us underrate him. He's young but not that young, cheap but not that cheap. As a bench player he's probably a non-tender next year. So I kind of suspect 29 other teams either don't need him, don't want him or will prefer to get him for nothing - not because the trade price would be high but because he'll cost half as much and they don't have to immediately put him on the 40 if they don't want to. I guess if a team does feel otherwise the Phillies can pay half his salary in exchange for that low-level guy. Certainly with the perfect combination of playing time, healthy and returning to form he is a useful piece. But I'm not sure that combination will occur. And his career OPS is about the same as Ben Francisco and John Mayberry Jr. at this point. Useful pieces but not valuable pieces once they reached a certain age/salary. No McCutchen is three years with an option for a fourth. He may not be here (or starting) by Year 3 but it won't be for Williams. My guess is that Altherr simply isn't good enough/valuable enough to make the team worse by demoting Williams (not to mention it would be hard on Williams). If Quinn gets hurt again you can add Lane Adams (using Altherr's spot on the 40) or one of the utility guys. In an emergency you still have four guys (both corner OFs, Williams, and Kingery) who can actually be out there for a few innings. The horizontal movement on his curveball is the lowest it's been, 9.24 inches, down from 9.75 last year, 9.61 the year before and 10.51 in '16. So, I dunno. 3 starts. He may be feeling the effects of an innings increase last year. Hard to say. He'll bounce back. Another perspective on Nola's early woes, with surprising detail, considering the source. Aaron Nola struggling this much was certainly not something many of us could have projected heading into the 2019 season. 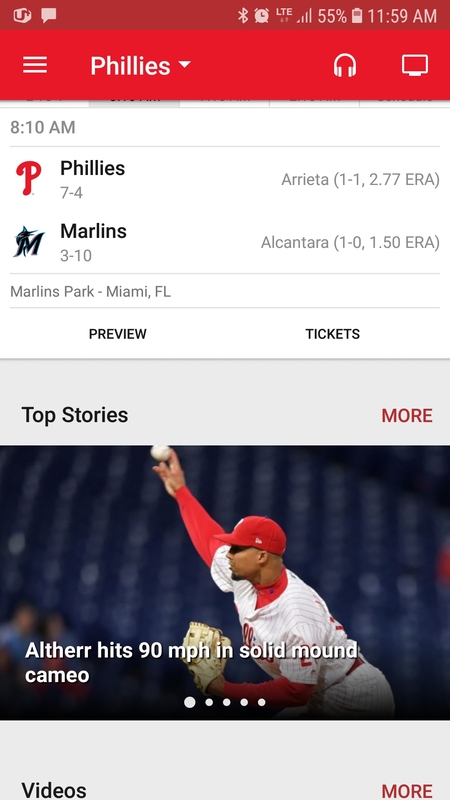 4/11/19:	Philadelphia Phillies optioned RHP Edubray Ramos to Lehigh Valley IronPigs. Phillies announce: Edubray Ramos optioned to AAA. Team will make corresponding move tomorrow. Came to the thread expecting 'sky is falling' rhetoric with regard to pitching staff over last two losses. Reassuring to see the Nola article and general levelheadedness of regular posters in the forum. Now he just needs to come up with a "sore arm" so we can stash him on the DL when Quinn is recalled. I think this points to some of the points made about Howard...he wasn't always a baseball players and is still learning some of the basic stuff. Let's just hope for more progress. I mean Jim Salisbury is a very nice and thoughtful man who has said a negative word about a Phillies decisionmaker exactly never in his career. So I'm not sure a puff piece about Spencer Howard with only internal organization quotes patting themselves on the back really is the persuasive piece of journo that Austinfan thinks it is. Since the hook of the story was that Johnny Almaraz was out west to scout Keston Hiura, perhaps a sentence about how much better of a prospect Hiura is then who we took ahead of him (Haseley) would have added some perspective. So he just picked a player in the minors and wrote a puff piece? I'm not gonna lie...it really seems as if you are pretty heck bent on everything being negative...the nerve of Salisbury to write an article introducing philly fans to a prospect. You're in mid season form Squire. Salisbury is writing about a pitching prospect with very good stuff that was a reasonably high draft pick now seen as one of our two best pitching prospects. I am sure he'd write the same thing about Medina. And each have questions about durability and the ability to get higher level hitters out with any consistency. Howard is a good pitching prospect with much to prove, partially because of his slow promotion path for a top prospect. One can praise him as the article did, note some of the parts of his background that might make for slower development, and still think he has much to prove. All in all it seems to be a good pick as he has developed more velocity than most scouts thought he would. We are probably both smart and lucky there. We'll take smart and lucky. Noted. I mean know that no scouting director is perfect but I do think the evidence is starting to mount that ours is below league average (at least based on industry consensus of our prospects/system) and considering the plethora of high picks that we've had. And it feels like some real blown opportunities in a division that has a ton of young talent (Atlanta, NYM) so I'm nervous about that. And this board does have a poster (not you) that literally has not had a critical word about the Phillies organization decisions of the past 6 years no matter what they were. In any event, I think Klentak did a dang near amazing job this offseason and I don't mind Kapler as a manager at all. I am hopeful that the new minor league hitting instructors and the relationship with Driveline (or whatever) makes the previous picks look better. I remember laughing on the day of the draft when the "best righty in the draft" started. I'll take lucky when we haven't been as smart. I did end up having to go back and look at Huira vs. Haseley...really high level of course in 2018.